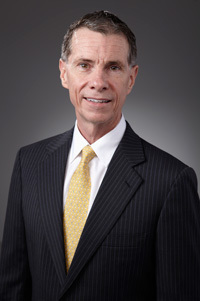 Success is second nature to James “Jay” A. Barrett, Jr., who’s been a leader in Nevada’s unique financial industry for decades. He first established an expertise in serving private companies and their owners, from business formation and estate planning to raising capital, as a CPA from 1975 to 1985. From there, he joined Marnell Companies, a privately-held company owning a portfolio of companies in architecture, construction, real estate development and various investment activities. He served as the senior financial executive and a member of the Board of Directors from 1986 to 2011. Under Jay’s leadership, the company’s combined revenues averaged $500 million through fiscal 2010. While at Marnell Companies, among his many responsibilities, Jay was CFO of TRIRIGA, a software development company, which was sold in an all-cash transaction to IBMin 2011. He was also Co-founder, President and a member of the Board of Directors of the Rio Hotel & Casino, Inc, a New York Stock Exchange-listed company that conceived, developed, owned and operated the Rio Suite Hotel & Casino, America’s first all-suite hotel casino. Founded in 1986, it was sold to Harrah’s Entertainment in 1999 at a value of $800 million. In July 2011, Jay founded The JABarrett Company to offer his wealth of experience in corporate finance, real estate, growth, organization and governance, performance improvement and strategy. Jay is a BSBA graduate, with an accounting degree, from the University of Florida and has maintained his license as a CPA since 1975.